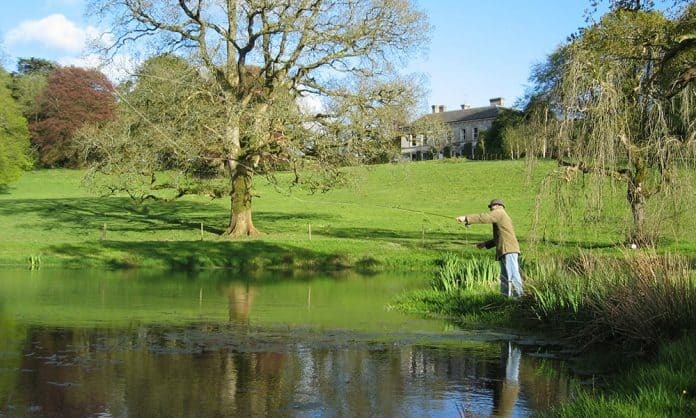 A Fly Fisherman casting his line on one of the lakes in the grounds of Ballyvolane House, Co. Cork. When planning a fishing trip in Ireland, it is worth noting that fishing licences are required for certain types of fishing only. Regulations state that no licence is needed for coarse angling, pike or trout; however, when fishing for salmon or sea trout, a licence is required. While this licence gives you the right to fish for salmon or sea trout, you will still probably need a permit from the owner of the waterway in question. On certain waterways there may be fly fishing only rules in place; therefore, it is always advisable to check with the waterway owner beforehand. Whether fly fishing or coarse angling, there are strict regulations in place in the Republic of Ireland when it comes to salmon and sea trout. Licences for this type of angling can be purchased from designated fishing shops or online from Inland Fisheries Ireland. There are two types of license: national and district. National licences cover all districts within the fishery board, while a district licence will only cover one particular area. Anglers purchasing a licence for salmon and sea trout will also be issued with tags and a logbook. Every salmon caught, and each sea trout over 40cm, must be tagged and details recorded in the logbook. The details of fish caught and subsequently released must also be noted. The tagging scheme provides valuable data for estimating stock numbers and recording catch statistics. As part of the fishing regulations, all logbooks and unused tags must be returned by 19th October each year, even if no fish were caught. There is a national bag limit in force for sea trout, which limits anglers on open rivers to three sea trout in any 24-hour period. In certain districts it is illegal to kill any sea trout. The fisheries districts in which this rule is in place are Galway, Ballinakill and Connemara. It is also illegal to sell any rod-caught salmon or sea trout over 40cm anywhere in the Republic of Ireland between 1st January and 31st October. Angling by-laws in the Republic of Ireland state that the only legal method of catching freshwater fish is by rod and line; furthermore, no one person may fish with more than two rods at any given time. In terms of bait, it is against the law to use live fish and, in specified waters, worms. Only single, barbless hooks are permitted. Although fishing licences are not generally required for coarse angling, there are still a number of regulations in place. By-laws state that it is illegal for any person, whether fly fishing or otherwise, to take and kill more than four coarse fish in any one day. Any coarse fish over 25cm in length, measured from snout tip to tail fork, may not be taken and killed by any means. If any fish covered by this law is taken accidentally, it must be handled with the utmost care and returned uninjured to the waters in which it was caught. Once again, although fishing licences are not required for pike, there are certain regulations that relate to pike fishing. No more than one pike may killed in a day by any one person; additionally, it is against the law to kill any pike measuring more than 50cm in length. By-laws also state that no person should be in possession of more than 12 coarse fish to be used as pike bait. Any person found with more than four coarse fish for bait must be in possession of a receipt confirming the purchase from a registered fish bait supplier or tackle dealer.